As a blogger, we should always try to use different ways of earning. No doubt Google AdSense is considered as the best possible way to earn from your blog or website due to their reliability and payout, but there are many other ways also to earn apart from AdSense. 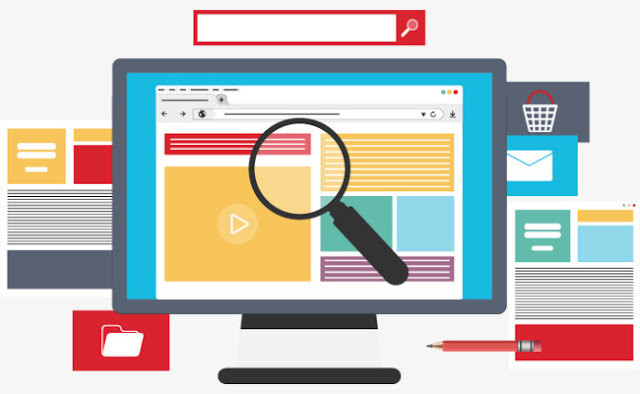 AdSense is a display advertising program where an ad will be displayed on your site and when the user clicks on those ads, you’ll generate revenue. In that article, we gave a brief introduction about the In text Ads. Today we’re going to cover all the details about in text ads. As we know in text ads are those ads which get associated with your contents on the blog. These ads don’t take extra space of your web page and so, is one of the most popular advertising programs in the world. You can find a good number of bloggers whose main source of income is in text ads. The most basic Question that most of the bloggers ask is whether they can use AdSense and in text ads together on the blog? Yes. You can use both the ad network on your blog. As in text advertising programs does not violate the AdSense policy so there is no harm in using both and in earning more dollars. There are many bloggers and webmasters those are using Infolinks (in text ad) and AdSense together (display ad) on their site. There is a good number of in text advertisers available in the market, and all have some pros and cons. But you can’t give a try to all of them. So today I’m going to cover the best 5 networks those are reliable and provide good values. You can use these ads with Adsense as well as can consider these as an alternative to Adsense also. Infolinks is considered as the best and most popular in text ad network available. This is easy to start and implement ad. Also, there are not many criteria to get approval from Infolinks. You can get very easily approval for the ads on you blogs or sites. Infolinks was founded in 2007 and very quickly become one of the top players in the in text ad network. 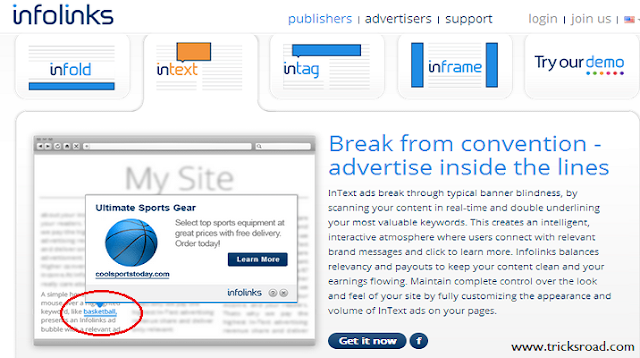 Infolinks offers a number of ways to display the ads on the websites like infold, intext, intag etc. When a user hovers their mouse over those, a relevant ad will appear. By this way, you will earn. Vibrant Media is also one among the very famous in text ad network and mainly famous for allowing publishers to create incremental monetization opportunities within the content. The company has more than 3000 advertising partners and so the chance of relevant ads increase a lot. In addition to the in text ads, Vibrant also offers traditional ads for its publishers. The only drawback with vibrant media is they require 500,000 page views monthly as a requirement. The best of vibrant is its payout threshold. They have the threshold of only $5. Kontera is also very famous in the in text advertising network and is dedicated to in text only. Recently Amobee has acquired Kontera and now run Kontera's business through their channel. In the blogging world its debatable topic as which is best Infolinks or Kontera? So it is ad visible to use both and the one which you like most, continue with it. But after Kontera got acquired by Amobee, its popularity has been reduced. It also worked on the basis of cost per click basis. The best thing about Kontera is there is not a strict rule about the traffic and even a very new website owner can easily get approval. Viglink is slightly different model compared to other in text ad networks. Viglink converts your normal link into affiliate link and so known as in text affiliate ad network. And so in place of earning few cents for CPC you can earn many dollars as an affiliate commission too. Suppose you have written some content about a product and it is available on Amazon store but you’re not a part of Amazon affiliate program, Viglink will convert your link to an affiliate link and when your visitor will buy through that link you’ll get a commission for that sale. The beauty of Viglink is you can use many affiliates on your site and so the chance of more income. There are no such traffic criteria for Viglink also and no minimum payment threshold also. I’m writing about Chitika at the end doesn’t mean that it is not so good or something. With a more than 350,000 publisher, Chitika is considered as one of the best in text ad network. This is also considered as an alternative of AdSense by many publishers also. So you can think about its popularity and reliability. Chitika is one of the very old players in the in text advertising network and recently have added Chitika Lynx in their arsenal along with other cool ads solutions. The minimum threshold is only $10 and works on the CPC basis. Even Chitika too not have any strict requirement about the traffic and even a newbie gets easily approval. The world of in text ad networks is not limited to just 5, but you can these are the best players in the market. Others also include Skimlinks, Clicksor, Taggify, Becontext and much more. We’ll discuss these also in some other post. Well, you can use any of the above ad networks to monetize your blog or websites but the earning potential depends upon many factors like demographic location, site traffic, and various other factors. Demographic location plays an important role. Some ad works better in US/UK, few not. So select the network depending on your location, traffic, and content. In past, I’ve used Kontera and Infolinks and they worked really well. I would love to know which ad network you use to monetize your site and how they are performing. Please let me know through comments. Also if you liked this post, do share it. Thanks. 3 comments to ''5 Best In-line Text Ad Networks for Bloggers"
Media.net can also be considered as a very good alternative. I'm using it, and I'm very much satisfied with the earnings through it. Though it is difficult to get an account, once if you got it , then say "welcome' to earnings "
Moreover the key for the revenue is traffic , not the ad service provider. Thanks for stopping by. Of course Media.net is one of the best alternative of AdSense but here I have only considered In Text Ad Networks and I think Media.net is display ad network and so not mentioned here. Thanks for the information bro and definitely in the coming posts, I'll consider it.